It has been SO COLD here in Michigan lately. All last week, the temp was in the single digits with the windchill being 20-something below 0. It's hard to believe I used to run in those temps. I just can't bring myself to do it now! A couple of days ago, the temp got up to 41, so the snow started melting. Then the temps dropped again, and it all froze solid. This morning, I was going out to my car, and as I stepped off of the last step on my porch, my foot slipped on the ice and I went down HARD. I landed on the concrete (covered with about 1/4 inch of ice) right on my hip, ribs, and shoulder. I nearly hit my head on the porch railing. I am way too old for this. My body is so sore right now! And I'm sure I'm going to have some nasty bruises. In other news, our new treadmill was delivered yesterday! 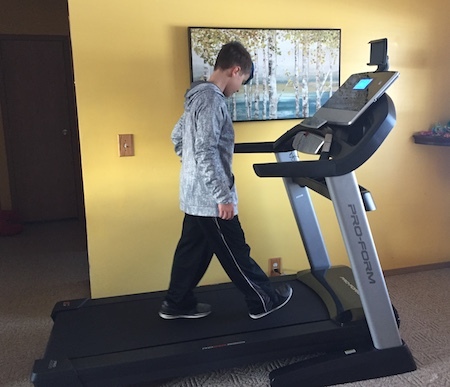 If you missed it, Jerry and I decided to get a treadmill to help us get back into running. After looking at a billion reviews (it was seriously the most frustrating task I've ever had), I settled on the ProForm Pro 2000. It was delivered in an ENORMOUS box. I was so excited to put it together! I absolutely love putting things together, whatever they may be--furniture, electronics, toys, whatever. I got to work right away. I only had an hour before I had to leave for a psych appointment, so I got as much done as I could before I left. I went to my psychiatrist's office, and there was a long wait in the waiting room. 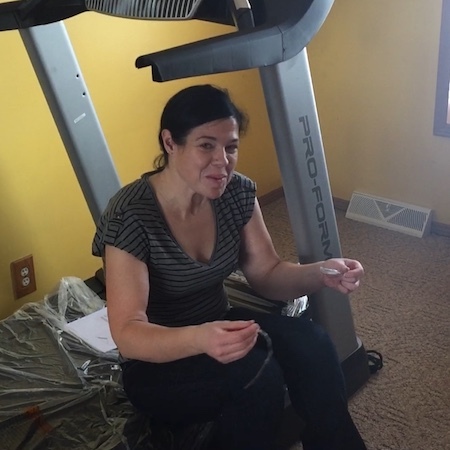 As I was sitting there, I realized that I had a piece of tape with some cardboard on my leg (from unpacking the treadmill). Then I noticed there were several more pieces! I had been sitting in the waiting room all that time with little pieces of tape and cardboard stuck all over me. It was hilarious. I reenacted the story for Jerry when I got home. Putting the treadmill together wasn't too bad! The instructions were clear, and the parts were labeled really well. It took a few hours, but when it was done, I felt so accomplished! I walked on it for a few minutes to test it out, but I didn't run on it until this morning. My training (I'll write about this below) starts on Monday, but I figured I'd get in a few short runs before then. The treadmill has a tablet holder, so I was able to watch a show while I ran. I started Band of Brothers, but I'm not crazy about it, so I may have to find something else. I wore my Garmin 620 with the GPS turned off, and the result was very, very close to what the treadmill read. I was impressed. I will write more of a review of the treadmill once I've had a chance to use it for a while, but so far, I really like it. The speed changes really quickly, which is nice--I will really appreciate that during speed work intervals. There is a decline option, which I've never had on a treadmill before--you can run at a grade of up to 12%, and then a downhill grade of -3%. Today, I just wanted to test out where my "easy" pace is. I mostly ran between 5.6 and 5.8 mph. My one complaint is that you cannot switch from miles per hour to minutes per mile, which is kind of annoying (and surprising! Runners like to know those things). But, since my Garmin is so accurate, I can just glance at that to know the minutes per mile. I finished three miles, and I felt great! My first big goal is to train for the Martian Half-Marathon. Jerry is going to do it with me, which is pretty exciting. The only half we've done together was the Detroit International Half, and because of my injury, we ran/walked it. We had SO much fun, though! I think training for a half together will be fun. Jerry's only done two--this Detroit one, and Indy in 2015. My sister is signed up for the Martian Half as well (actually, she's the one who asked me to do it), so it'll be a good time. Our training starts on Monday. 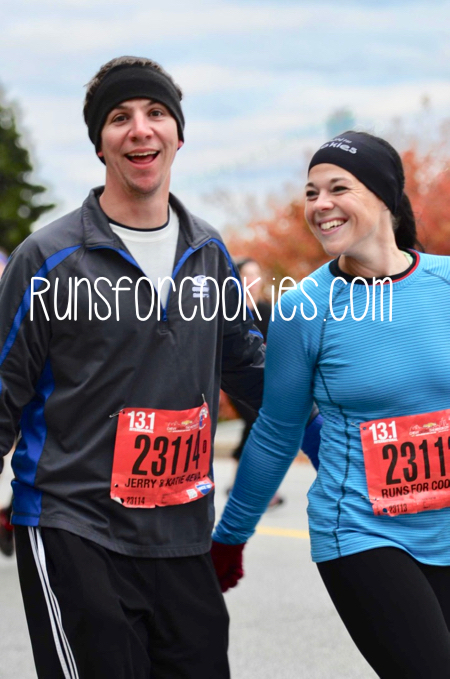 We are going to do the "First Timer's Half Marathon Plan" that I wrote recently. It's four days a week, and about as simple as I could make it for a beginner. I'm clearly not a beginner runner, but considering I ran less than 200 miles last year, I'm basically back to beginner status. And honestly, I kind of love that! I don't feel any pressure to go fast. I don't have a time goal for the race (it would be nice to run a sub-12:00 pace, but I won't be upset if it's slower). Each increase in my long run will feel like a big accomplishment. My first long run is four miles, and I'm actually a little nervous about that. How weird is that?! So, training for the half goes from January 15 through April 17. That training is going to be my sole focus as far as running goes. I'm not doing any 5K's or 10K's or anything during training. I'm hesitant to make plans beyond the Martian Half, because I don't want to get burnt out like I did last year. However, I will need to have some sort of plan in place so that I don't have that huge letdown of "what's next?". Right now, I'll just take it one step, one week, one run at a time. And honestly, I'm looking forward to seeing my progress! stick with Band of Brothers, it's amazing as a whole piece. I really want to get a treadmill but dont have any floorspace for it. I'm hoping to move house this year so fingers crossed. Where I live walking or running outdoors isn't pleasant so a treadmill might make me move more. That treadmill looks great! I love that it has a tablet holder. I'm kind of right with you in terms of "starting over" with running so I'm really looking forward to following along with your journey! My half marathon is on May 12. Also, omg I feel you on these cold temps! I live in Wisconsin and it's been absolutely frigid! Today is a very rare day, high of 52 today! Feels like spring right now! But this afternoon they're saying back to the teens :( I hope you feel better after your fall, ouch! Glee is one of my favorite shows to run to on the treadmill - the music intervals are great pick-me-ups and motivators. 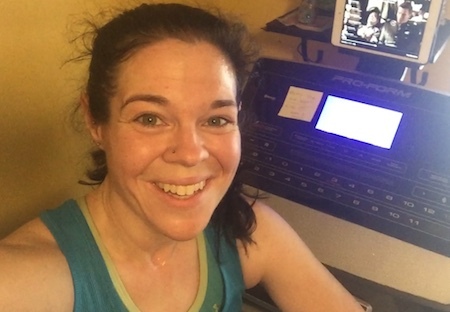 I hope you love your treadmill as much as I do! I live in Michigan too and I just love that I can keep up my workouts no matter what our crazy weather is! I watch show on my tablet while I run and I even look forward to the run because I get to catch up on my shows. Your room with the treadmill looks so nice. I love the bright wall color and the painting behind Eli. Can you remind me what HR % you suggest for easy running? I'm looking forward to returning to running, and I want to work on running easy as a way to see if I can avoid my constant injuries. Band of Brothers is really great, but starts slow. I'd say stick with it for at least a couple episodes. Hi Katie. I am a long time reader but don't comment often. I love reading your blog. I just saw the picture of the treadmill sitting on your pretty cream carpet. I have a Pro Form treadmill (i have had multiple brands and they actually all do this) and cream color carpet. The treadmill will probably put some sort of black dust stuff off that will not come out of the carpet after it gets ground in too much. It was really disappointing to have these stains in the carpet when I changed my mind on the treadmill's location in the house. To protect the new carpet, I went to Lowe's and bought some gray fabric stuff that they cut off a spool in the length that you request to put under my treadmill. It is way cheaper than the special treadmill mats that they sell but still protects the carpet from stains. Loved your post and may just download this training plan! I’m back to square 1 after not running for a while! Love having a goal race so will have to find one near me! As far as shows for something totally different you could stream the Great British Bake Show, there are 4 seasons with around 10 episodes, each about 50 minutes! It would definitely distract you! Just fun to watch! We printed out a big chart with mph to min/mile conversions so we know what pace is what when we are doing speedwork or whatever. It helps a lot!